Molecular mechanics uses Newtonian mechanics to model molecular systems. The potential energy of all systems in molecular mechanics is calculated using force fields. Molecular mechanics can be used to study small molecules as well as large biological systems or material assemblies with many thousands to millions of atoms. All-atomistic molecular mechanics methods have the following properties: Each atom is simulated as a single particle Each particle is assigned a radius (typically the van der Waals radius), polarizability, and a constant net charge (generally derived from quantum calculations and/or experiment) Bonded interactions are treated as "springs" with an equilibrium distance equal to the experimental or calculated bond length Variations on this theme are possible; for example, many simulations have historically used a "united-atom" representation in which methyl and methylene groups were represented as a single particle, and large protein systems are commonly simulated using a "bead" model that assigns two to four particles per amino acid. Biomolecular motors are proteins that convert chemical energy, Adenosine Tri-phosphate (ATP), into mechanical energy for transport inside cells. There are three types of motor proteins: Kinesin, Dynein, and Myosin. The stem is shown attached to a substrate. It is bent at the narrow neck, and continues across the rear face of the head as the linker. It joins the first of six AAA domains that have been identified in dynein sequences. The first four of these bind nucleotide. The last two probably don't, and are shown grey. The C-terminal part of the dynein heavy chain has an unknown fold, and is illustrated as a black blob. Between AAA4 and AAA5, the antiparallel coiled coil stalk carries the microtubule-binding domain at its tip. The microtubule is not drawn to scale. The power stroke is envisioned to start by the tip of the stalk increasing its affinity for the microtubule, inducing a change in the coiled coil that is fed round the ring of AAA domains to accelerate product release from AAA1. We suggest the message is relayed by a concerted slewing of these AAA domains. As a consequence of the rigid coupling of the linker to AAA1, the head rotates relative to the linker, swinging the stalk anticlockwise, and translating the microtubule about 15 nm to the left (thereby moving the dynein towards the minus end of the microtubule). The model shows what would happen under zero load conditions. S.A. Burgess, M.L. Walker, H. Sakakibara, P.J. Knight & K. Oiwa (2003) Dynein structure and power stroke. Nature, 421, 715-718. Tthe mechanism by which chemical energy is converted into mechanical work in biological systems. Cells store chemical energy in two forms: as transmembrane electrochemical gradients and in chemical bonds, particularly the gamma phosphate bond in adenosine triphosphate (ATP). ATP is the most important chemical energy source in all living cells. In mitochondria, bacteria, and chloroplasts the free energy stored in transmembrane electrochemical gradients is used to synthesize ATP from ADP and phosphate via the membrane-bound enzyme ATP synthase. ATP synthase can also reverse itself and hydrolyze ATP to pump ions against an electrochemical gradient. 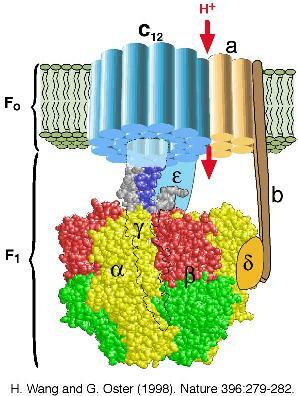 ATP synthase consists of two portions: a membrane-spanning portion, Fo, comprising the ion channel, and a soluble portion, F1, containing three catalytic sites (see the Figure below). Both Fo and F1 are reversible rotary motors --- perhaps the smallest motors known to science. Fo uses the transmembrane electrochemical gradient to generate a rotary torque to drive ATP synthesis in F1 or, when driven backwards by the torque generated in F1, to pump ions uphill against their transmembrane electrochemical gradient. F1 generates a rotary torque by hydrolyzing ATP at its three catalytic sites or, when turned backwards by the torque generated in Fo, as a synthesizer of ATP. From Abrahams et al: "...the three catalytic beta-subunits differ in conformation and in the bound nucleotide. The structure supports a catalytic mechanism .. in which the three catalytic subunits are in different states of the catalytic cycle at any instant. Interconversion of the states may be achieved by rotation of the alpha3beta3 subassembly relative to an alpha-helical domain of the gamma-subunit." This page was last modified on 16 September 2018, at 14:41. This page has been accessed 20,943 times.